Samsung’s Galaxy S series of flagship smartphones are quite possibly, the most sought-after premium Android devices in the world. And this year, the company is giving buyers three options to choose from – the top-notch Galaxy S10+ (review), Galaxy S10 (first impressions) and Galaxy S10e (first impressions), which coincidentally, is the most affordable handset of the lot. We’re working on our full review of the smartphone, which should be up on the blog shortly but for now, let’s shed some light on the accessories the device ships with. 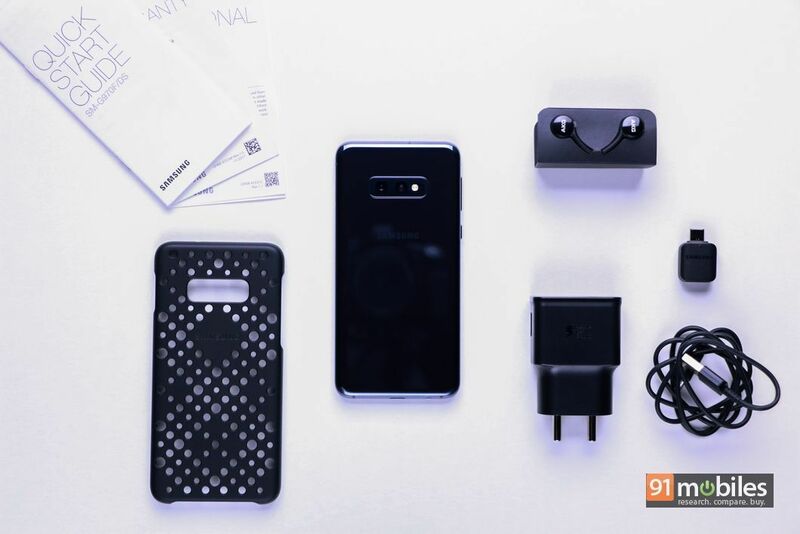 The Samsung Galaxy S10e comes bundled in a bluish-black cardboard box, opening which buyers will find the smartphone itself, followed by some documentation, a rather unique punch holes-toting case (get it? ), a wall charger and a USB Type-C cable. What’s more, since Samsung’s latest flagships sport the 3.5mm headphone socket, the company has even bundled a pair of AKG-tuned earphones with the device. The smartphone ships with a screen protector slapped to the display, which is a nice touch too. To bring you up to speed on the phone’s specs, the Samsung Galaxy S10e sports a 5.8-inch FHD+ Dynamic AMOLED panel with a punch-hole towards the right. The handset is backed by the Exynos 9820 octa-core processor which works alongside 6GB of RAM and 128GB of built-in, user-expandable storage. The smartphone ships with a dual-camera setup towards the back comprising a pair of 12MP and 16MP sensors along with a 10MP selfie shooter on the front. The S10e is fueled by a 3,100mAh battery, which comes with fast charging support. 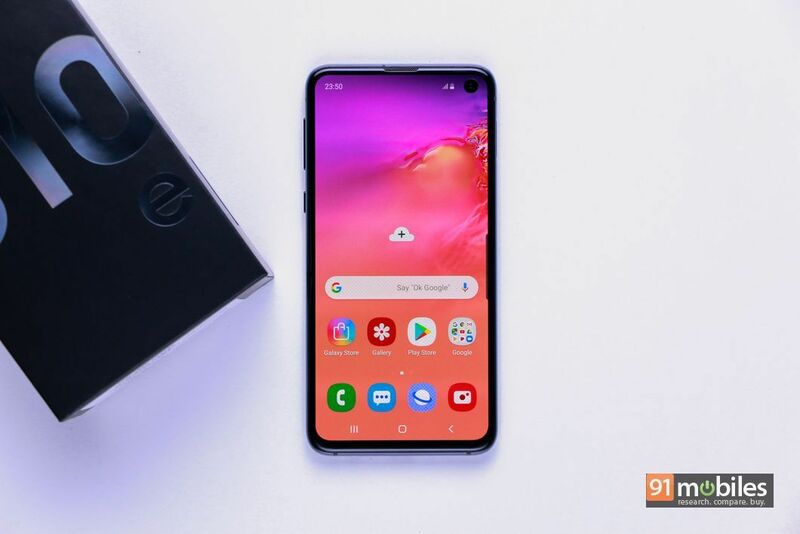 In terms of the software, The device runs Samsung’s One UI on top of Android Pie and costs Rs 55,990. Our full review of the smartphone will be up shortly on our blog, so stay tuned.